In 'Killing time' Ricky Swallow has synthesised his interests in time passing, personal and collective memory, everyday experiences and the history of art. Swallow's earlier sculptures were often carefully crafted duplicates of recently retro items, such as beatboxes and BMX bikes, or reworked record turntables with scaled-down narrative scenarios that blend science fiction and scientific fact. More recently he has made carvings of the animate and inanimate conceived and realised at a ratio of 1:1. 'Killing time' is the most ambitious work that Swallow has made to date and is likely to remain so for some time due to the onerous and time-consuming physical task of working in such detail on this scale. It was the centrepiece of Swallow's solo exhibition at the Australian Pavilion in the 2005 Venice Biennale. 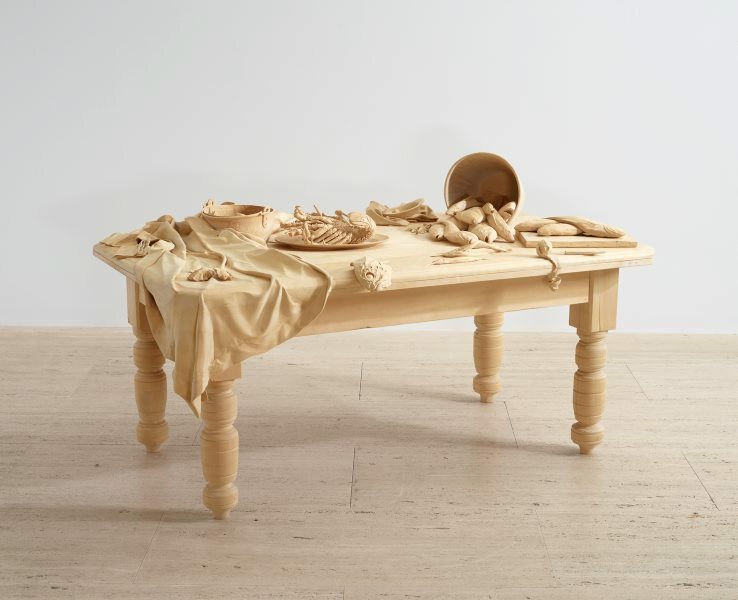 While 'Killing time' visually recalls 17th-century Dutch still-life painting and even the work of such a virtuoso illusionist woodcarver as Grinling Gibbons, the subject matter is derived from Swallow’s personal experience. The son of a fisherman, he has faithfully depicted every sea creature that he recalls capturing, killing and eating during his life. The various fish, lobsters, oysters, crabs and others are displayed on a table which duplicates the table around which Swallow’s family ate dinner. While 'Killing time' uses the visual language of a particular genre of painting and wood-carving, it is also an intensely personal act of remembering; it is another 'evaporated self-portrait' as Swallow has described his sculptures, which call on specific personal memories while also having a commonly recognisable subject matter. 'Killing time' is carved mainly from laminated jelutong, a pale coloured hardwood used commercially for prototypes and pattern-making but also by woodworking hobbyists for whittling. The illusionism of the sculpture is emphasised by the attention to detail in the lobster, the lemon peel that hangs over the edge of the table and the rippling folds of the tablecloth pushed to one end. However the monochromatic timber and the dramatic side-lighting, devised by Swallow to create strong shadows and highlights, point to the inherent unreality of transcribing animate form into inanimate materials. There is a loop of commemoration and death that permeates this work, both in the references to the still-life genre and in the fact that the sculptor killed these creatures in the first place, long before carving this de facto memorial. In the 17th century, vanitas still-life paintings portrayed the abundance of natural life and worldly goods to celebrate this abundance while pointing to the fact that it was only transient, just as life itself is. The title 'Killing time' refers to this sense of life stilled in art, to the act of remembering and recording something from the artist’s past, and to the time spent on carving this labour-intensive sculpture.